This week for our HOT TOPIC we take a look back at some of the greatest National Hunt Horses that ever lived and we sit and chat with 3 of our Tipsters this week from our Sister Site, Tipsters Empire. The Snout, The Jumps Punter and The Tower – 3 National Hunt Specialists, talk all things legends! Cheltenham is getting ever closer and this list of superstars have lit the place up in their own magical careers. Let’s sit down and relive some of the greatest. The Tower – Ask many racing fans who they set their watch by and DENMAN would be the answer. Not by coincidence he was named ‘The Tank’ for his remorseless ability to grind opposition into the ground and run all the way to the line. His battles with Kauto Star were legendary and were it not for Kauto, who’s to say how many Gold Cups DENMAN would have won? For Paul Nicholls, having both horses in his yard was like the gift of a lifetime. His crowning glory came in a race that still makes the hairs on the back of my neck stand up as I type these very sentences. The 2008 Gold Cup at Cheltenham was the classic battle between Kauto and Denmen, with the latter coming out on top. His relentless jumping style (he often showed little respect for his fences) marked him out as a horse the others simply had to get out the way of. When The tank was coming through, it was best to let him do his work. Sam Thomas was able to enjoy his own career highlight aboard the winner that day, and Denman was a horse that thrilled so many – both inside and outside the game. His victory off top weight in the 2009 Hennessy was another standout performance, defying all the odds to score. He was a horse who, even in defeat, lost nothing and truly helped to define racing for a generation. The Jumps Punter – The first horse in my list of greatest National Hunt horses is Best Mate. He was the first high profile horse that I absolutely loved watching and still to this day remains one of my favourite horses. At the time of Best Mate’s three Gold Cup wins I don’t feel the 3m chase division was at it strongest especially when we fast forward to the epic battles of Kauto Star and Denman. That said, Best Mate is the only horse since Arkle to have won three consecutive Gold Cups which in any era of racing is some achievement given how fragile racehorses can be. To come back year after year and win the greatest race in National Hunt Racing is some achievement and for that he deserves is place in my best National Hunt horses. Best Mate ran 22 times and never fell in any of his races. He won 14 times and was placed second seven times. Five of those wins came in Grade 1 company, the numbers are just so impressive. The only time he never completed a race was (sadly) his final race when he ran in the Haldon Gold Cup at Exeter where he was pulled up and shortly afterwards collapsed and died on the racecourse of a suspected heart attack. It was such a sad end to a horse that had given his all and had given racing fans so many happy memories. It goes to show how much people loved this horse as it made the front pages of the national papers the following day. The thing that I loved about this horse was the sheer guts and determination he showed in wanting to win. He was a real battler and coming from one of the smaller racing stables made his achievements that bit more special. The Snout – I have a complete soft spot for fillies and mares, and although of modern times Annie Power is probably the best mare I have ever seen live, Dawn Run completed a feat that has never been done by another horse and that is to win the Champion Hurdle and then go and win the Cheltenham Gold Cup. That is an incredible feat considering the races are just so different – one requiring speed and agility over hurdles, and the other requiring almost unlimited stamina and guts to get up that hill. Her roll of honour is perhaps not as long as some of the others that you would put in these kind of lists, but for a mare to complete Cheltenham Festival glory in that way is an achievement that not many will ever do. The Jumps Punter – Sprinter Sacre is the second horse to make my list. For me, there is no better sight than watching 2m chasers racing and jumping at speed. Sprinter Sacre ran four times over hurdles winning twice and finishing second and third in his other two outings. He really came into his own, however, when switched to fences and he was just a fantastic horse to watch. The manner in which he travelled and jumped set him apart from his rivals. Nothing could get near him in his first two seasons over fences in which he won the Arkle and followed up the year after by winning the Champion Chase by 19 lengths. He then went on to win at Aintree and Punchestown. At this point in his career, he looked totally unstoppable. On his first start of the 2013-2014 season, he was pulled up at Kempton and tests revealed he was suffering from an irregular heartbeat. He wasn’t seen again until January 2015 where he finished second and given his problems and the time he had been off the course it wasn’t a bad performance. On the back of that he started favourite for the Champion Chase but he was pulled up. This one time horse that looked unstoppable had become a shadow of his former self and it looked like his best days where behind him. During the summer I was half expecting to hear that he had been retired but he came back in November and won on his first start of the season and while he didn’t look the same horse of a few years ago he put in a good performance to win by 14 lengths. In truth, he didn’t need to return to his best as the performances he had put up in the early part of his chase career where in a totally different league. He went on to regain his Champion Chase crown that season and in total he ran four times that season and won all four races. For a horse to suffer from the condition he did and come back and reclaim his Champion Chase crown is truly remarkable a lot of credit goes to the trainer and the stable staff. He put in some really good performances in his last season but you could see by watching him he wasn’t quite the horse he once was but that just made you realise what a magnificent horse he was prior to his health issues. The Tower – KATCHIT is not the most obvious choice of a National Hunt great but, in many ways, that is what makes him such a special animal. He was little more than a moderate animal on the flat, winning just once from 16 starts, and his switch to hurdles hardly had connections buzzing with excitement. But something about that sight of timber would galvanise this small horse with a huge heart and he won 10 races during a stellar career over obstacles. The highlight was one of my own favourite memories in racing – the Cheltenham Festival in 2007 – when he destroyed the Triumph Hurdle field by 9 lengths. I had backed him that day and, along with what seemed like thousands of others in the corner of one tiny bar, roared him up the hill. The thrill of the win…the style…the celebration of Choc Thornton…it had it all. And just a year later, Katchit would go on to win the Champion Hurdle in far gutsier style, proving he had he heart of a lion. A special horse who proved size most definitely wasn’t everything and one who captured the hearts of the racing public. The Snout – Every time I visit Cheltenham racecourse now, the first step is always to enjoy a Guinness in the Arkle bar, and the memorabilia of this wonderful racehorse that decorates the place shows just what incredible achievements this horse made. He is widely considered the best National Hunt horse there ever has been, with a Timeform rating of 212. He was in fact so good, that a whole new handicapping system had to be brought in, whereby there would be one set of weights for a race which included Arkle, and the other for races without him. He was known as a spectacular jumper, that dominated 3 Cheltenham Gold Cups in successive years, and thankfully the many areas of the mecca of National Hunt racing is dedicated to his career as a racehorse. The Snout – 30 starts in Britain. 19 wins. His roll call of triumphs is simply unbelievable. 2 Tingle Creek’s, 4 Betfair Chase’s, 5 King George’s and 2 Cheltenham Gold Cup’s. It showed his versatility as a racehorse that he could win the tightest and fastest of 2 mile chases at Sandown, which gave an incredible test on a horses ability to jump, and then could go and grind out a gruelling 3m2f around Cheltenham when asked for every inch of his stamina in the process. For many people of this generation, he will be the epitome of a National Hunt chaser, and deserves every plaudit thrown his way in the process. The Jumps Punter – Kauto Star for me is the best horse I have ever seen and the reason is simple. Not many horses can achieve what he did at the highest level and that was to win a Tingle Creek over 2m and then in the same season win the Gold Cup over 3m 2f. Regards to ground he could simply win on any going and at Grade 1 level as well. Kauto Star, also for a period of time, looked like his best days where behind him but like all champions, the one thing they all have in common whether it be humans or animals is the determination and desire to win. The ability to bounce back when they have been written off and he did this in his last season by winning the Betfair Chase at Haydock and then went on to win a record fifth King George. There was no fairytale ending in the Gold Cup where he was pulled up and later retired. He won the Cheltenham Gold Cup twice, in 2007 and 2009, becoming the first horse to regain the Gold cup after losing it in 2008. He also won the King George VI Chase a record five times. In 2005 – 2006 season the Stayers Chase Triple Crown was introduced for horses who won the Betfair Chase at Haydock, The King George at Kempton and the Cheltenham Gold Cup. Since it’s introduction only Kauto Star as managed to win the three races. In total he won 16 Grade one races and for me in my time within racing he is best National Hunt horse I have seen for the sheer fact he won a Grade one at 2m and the same season won the Gold Cup at 3m 2f. For any horse to win at those two distances is, in my opinion, an impressive achievement but to do this at the highest level and in the same season is brilliant and that is why he takes the number one spot in my best National Hunt Horses. What do you think about our list? Who have we missed out? Who is THE greatest? Join us as the excitement to Cheltenham builds! 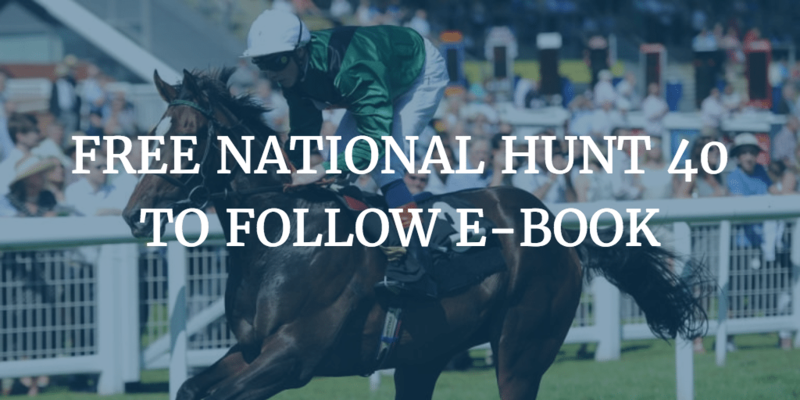 Tipsters Empire also offer a free National Hunt Horses to follow e-book – why not grab your download now, for FREE!